The Vehicle Stability Control (VSC) is a system in a lot of Toyota & Lexus cars that help the car from sliding during harsh climatic conditions. The moment the VSC system realizes that the car is losing traction, it will automatically apply to brake on all of the car’s wheels and keep the car from further skids. Engine power is also reduced, and this gives the driver better control of the vehicle. Through the system, the driver can manage understeering, emergency cornering, and skidding. The VSC has been responsible for the reduction of road accidents during rainy, foggy and snowy weather conditions. 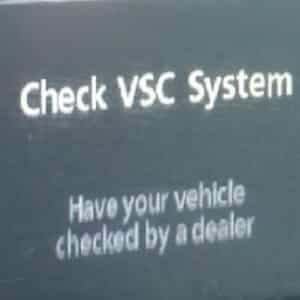 It is therefore vital to check the VSC system on your Toyota or Lexus whenever it starts to malfunction. What causes the check VSC light to go on? When the VSC Light shows up, it means that there is an issue in your VSC or ABS system and your ABS/VSC system will not function properly. The VSC works together with the ABS. If you are driving under blizzard conditions, the snow can interfere with the ABS sensors prompting the check VSC system light to turn on. You may also get a “C1201” engine error code. The first thing you need to do is let the snow thaw. You can then reset the error code. This clears the light most of the time, but if it does not work, you may need to see a mechanic or use an OBD2 scanner for further checks on your ABS. How does the VSC system work? The VSC is the car’s internal traction control system. Whenever you drive through slippery roads and lose traction, the system roars to life giving you better steering ability. Each of the wheels of the car will have electronic sensors that communicate with the car’s Powertrain Control Module (PCM). When the driver experiences problems in steering control, the VSC will automatically reduce engine speed while giving braking power to the wheels that need it the most. The wheel sensors relay information about the horizontal and vertical motion of the wheels. 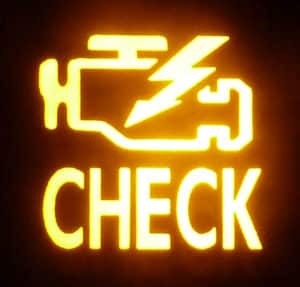 Whenever you notice the check VSC system light coming on you could be having problems with your sensors, or the steering rack. There moments that the VSC light will be accompanied by the ABS light or check engine light. The ABS works closely with the VSC. ABS stands for anti-lock brake sensor. It is used to measure the rotational speed of the tires and relays this information to the car’s Engine Control Module (ECM). Wheels often do not rotate at the same speed due to their contact on the ground. Whenever the ECM notices that there is some skidding, it locks up some of the wheels, and this prevents the car from skidding. The ABS mechanism often consists of a coil housing a magnet and a toothed ring. A signal is produced by the magnetic field, and it is later transformed into a digital signal. With the inclusion of VSC, drivers have better control of their cars. Other advanced electronics that are used in conjunction with the VSC include the Acceleration Slip Regulation (ASR). This integrates some parts of the ABS and the car’s electronic accelerator. If you are driving along a slippery road and one of the tires loses traction, the ASR will send communications to the engine management system and power is reduced to the slipping wheel. The Dynamic Stability Control (DSC) is activated whenever you are driving through gravel and sandy roads. It allows one or more wheels to slip and increases traction to some wheels. The Electronic Stability Control (ESC) is a safety mechanism for cars that was developed in 1995 to aid vehicles in traction control. It works with the ABS and VSC. Toyota introduced the system in the 90s. VSC systems work on a variety of surfaces from frozen lakes to tarmacked roads. Humans are unable to react fast when the car starts to skid. By the time you engage the brakes – which may not be working – you may find yourself face to face with an oncoming car. But with a VSC system, it takes control even before the driver realizes that he is losing control. It will estimate the direction and length of the skid and give braking power to the wheels that need it the most. The car will then be brought back to the driver’s command. Some people have criticized ESC systems for creating overconfident and careless drivers, but it has to be responsible for the reduction of many accidents – especially during snowy climatic conditions. The VSC system works within the direction of the driver. According to a study conducted by the US National and Safety Administration in 2004, it was estimated that the use of ESC reduced the accidents by up to 35 percent. When it comes to SUVs those with ESC systems managed to avoid road accidents by 67 percent, later, an organization called US insurance institute for highway safety concluded that over 10,000 fatal crashes in 2006 would be avoided if the cars had ESC systems. 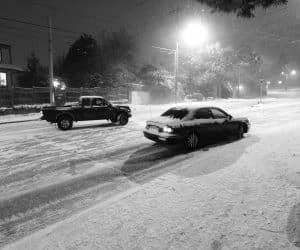 Traction is important if you are driving on snowy and rainy seasons. The chances of oversteering are high and with the probability of fog, you could find yourself hitting an oncoming car or obstacle. VSC sensors are critical for the performance of the system and the check VSC system light the moment it goes on. If you have a scan gauge then resetting the VSC light should not be difficult. However, you can first switch on the engine to ACC and long press the odometer until it reads the actual mileage. Switch off the engine completely and turn it on again but this time pressing the odometer button. This should clear the VSC light. If this does not work, you could be having problems with the wheel sensors that relay information to the onboard computer. The sensors with time get worn out. To make the troubleshooting a lot easier, you should read the trouble codes from your car with an OBD2 scanner. The VSC system in many Toyota vehicles is critical for traction control whenever the car starts skidding. The system works in conjunction with the ABS. Since the VSC uses sensors, it can start to malfunction as the sensors get old and worn out. You can first try to reset the VSC light if it is constantly on and if this does not work consult a mechanic for sensor replacement.